By using Row Level Security(RLS) you can filter and block access to individual rows within a table based on some custom logic that you write inside a predicate function. You can apply filter predicates on any select, update ot delete statement so that rows deemed inaccessible to the user are not processed by the select , update or delete operation. 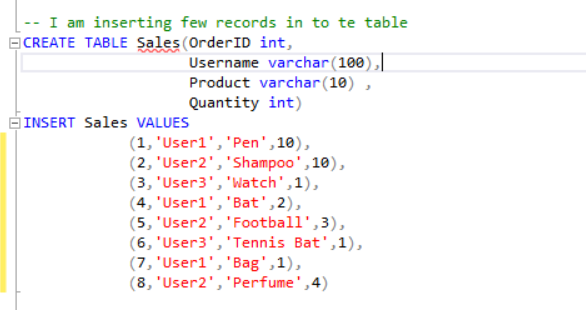 Security Predicate Functions are table valued function (TVF) which you write in T-SQL. This TVF must be a schema bound which means that all object references, tables or other functions must be fully qualified by schema name even if it’s default dbo schema. For showing the demo I have created a sample Sales table where with orders where we want each salesperson to access only the orders in the table they are assigned.Means each person should have private access to their owns orders and none of the sales person can access to other salesperson orders.So we will grant read only access to their orders and only one admin user has read and write access to all the rows in a table. You can see username parameter which map to the username column when we create the security policy below. In the above function you can see Table return WITH SCHEMABINDING which is mandatory for predicate functions. When I select the above predicate function you can see a permission error . The SELECT permission was denied on the object ‘fn_securitypredicate’, database ‘SampleDB’, schema ‘sec’. which is expected because we will not allow the normal users to execute the table valued function selecting from directly. For testing i am giving a temporary grant select permission to the User1. Let’s select the records from sales table and you can see no records return because Now it’s run under default dbo user.